1.In a bowl, combine cinnamon, turmeric , pepper , ginger, 2 teaspoons salt, and 4 tablespoons oil. Add chicken and toss to coat; let sit at nearly 20 minutes and up to 1 hour. 2.Heat 3 tablespoons of olive on the basis of a tagine or a large pot oil over medium-high heat until hot but not smoking. Add half the chicken and cook, uncovered, for 6-8 minutes total, turning halfway through cooking, until golden. Transfer to a plate and repeat with remaining chicken, adding 3 tablespoons oil for cooking. Transfer to plate. 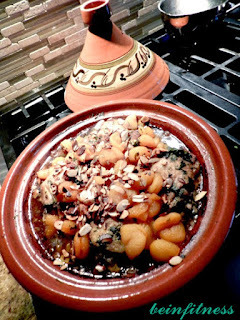 3.Add onions and remaining 1 teaspoon salt to tagine or a large pot and cook, uncovered, stirring frequently, until the onions are soft and translucent, 8 minutes. Add garlic and cook, stirring for 3 minutes. Tie cilantro and parsley sprigs in a bundle with kitchen twine and add to the pot along with 1 cup water, boiled chicken and any juices that have accumulated on the plate. Reduce heat and simmer, covered, 30 minutes. 4.While the chicken is simmering, bring honey, 1 cup water, cinnamon sticks and apricots to a boil in a small saucepan. Reduce heat and simmer, uncovered, until apricots are tender and plump and the liquid is reduced to a glaze, 10-15 minutes. 5.While the apricots are simmering, heat 1/4 cup olive oil in a small skillet over medium heat and cook the almonds, stirring occasionally, until golden, 1-2 minutes. using a slotted spoon, transfer the almonds to paper towels to drain, allow the oil to cool before discarding. 6.10 minutes before chicken is done cooking add the apricot mixture to the pot but remove and reject cinnamon sticks. Finish cooking the chicken. 7.Serve chicken topped with the toasted almonds and more freshly chopped herbs.